100% WILD, which is even better than Organic. Regularly $399.50, save $30! Only: $369.50. Includes overnight shipping. Each season - for a limited time - schools of mint-bright King Salmon arrive in the cold, clear waters off Kalgin Island. With a flavor second to none, loaded with healthy Omega 3 oils, these wild Alaska Kings are a rare gourmet prize. Our Wild Salmon fillets are skin-on and 95% Bone free. Fillets are approximately 8 -16 ounces each. If you would like to avoid bones you can request tail portion fillets. Fresh flash frozen, vacuum packed. Heat oven to 400 degrees Fahrenheit. Blend mustard, butter and honey in small bowl; set aside. Mix breadcrumbs, pecans and parsley in another small bowl; set aside. Season Alaska Salmon fillets/steaks with salt and pepper. Place on non-stick or spray-coated baking sheet or broiler pan. Brush salmon with mustard-honey mixture. Pat bread crumb mixture onto top surface of salmon. 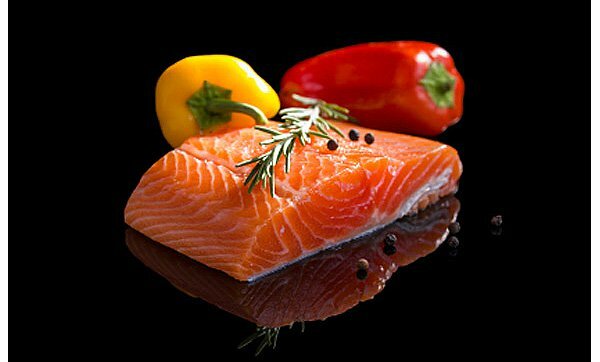 Bake for 10 minutes per inch of thickness, measured at thickest part, or until salmon flakes easily when tested with a fork.